The ultimate journey to discover how we went from there being nothing at all to there being something, and then how a little of that something turned into us, and also what happened in between and since. Bill Bryson is one of the world's most beloved and bestselling writers. In A Short History of Nearly Everything, he takes his ultimate journeyinto the most intriguing and consequential questions that science seeks to answer. It's a dazzling quest, the intellectual odyssey of a lifetime, as this insatiably curious writer attempts to understand everything that has transpired from the Big Bang to the rise of civilization. Or, as the author puts it, "
how we went from there being nothing at all to there being something, and then how a little of that something turned into us, and also what happened in between and since." This is, in short, a tall order. To that end, Bill Bryson apprenticed himself to a host of the world's most profound scientific minds, living and dead. His challenge is to take subjects like geology, chemisty, paleontology, astronomy, and particle physics and see if there isn't some way to render them comprehensible to people, like himself, made bored (or scared) stiff of science by school. His interest is not simply to discover what we know but to find out how we know it. How do we know what is in the center of the earth, thousands of miles beneath the surface? How can we know the extent and the composition of the universe, or what a black hole is? How can we know where the continents were 600 million years ago? How did anyone ever figure these things out? The adult version of a children's thousand amazing facts book - indispensable, understandable, funny and timely. Bryson, writer extraordinaire and self professed science phobic, has successfully turned his hand to making all things scientific comprehensible to mere mortals - including geology, chemistry, paleontology, astronomy, and particle physics. … the more I read of A Short History of Nearly Everything, the more I was convinced that Bryson had achieved exactly what he'd set out to do, and, moreover, that he'd done it in stylish, efficient, colloquial and stunningly accurate prose. We learn what the material world is like from the smallest quark to the largest galaxy and at all the levels in between. The basic facts of physics, chemistry, biology, botany, climatology, geology -- all these and many more are presented with exceptional clarity and skill. To those acquainted with the popular-science writing Bryson has digested, his repackaging is a trip down memory lane, but to his fellow science-phobes, Bryson' s tour has the same eye-opening quality to wonder and amazement as his wildly popular travelogues. ... to read Bryson is to travel with a memoirist gifted with wry observation and keen insight that shed new light on things we mistake for commonplace....a trip worth taking for most readers. Loads of good explaining, with reminders, time and again, of how much remains unknown, neatly putting the death of science into perspective. A terrific read, Bryson cleverly blends science and wit. 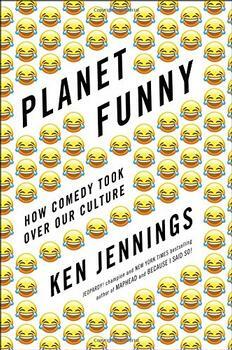 From the brilliantly witty and exuberant New York Times bestselling author Ken Jennings, a history of humor - from fart jokes on clay Sumerian tablets all the way up to the latest Twitter gags and Facebook memes - that tells the story of how comedy came to rule the modern world. A biologist shows the influence of wild species on our well-being and the world and how nature still clings to us - and always will.